How du you like this page? 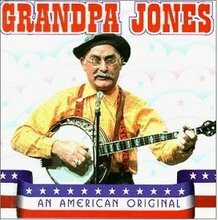 Welcome to the one (and unfortunately only) official Grandpa Jones Fanpage! Here you find biographies, pictures, videos, songtexts, links and much more about one of the greatest Country Legends! A short one out of the early 70s.. This video is probably out of the later 80s or the 90s. Grandpa Jones looks very old here but he still had the power to sing and laugh! This video was just added to the Internet a few weeks ago in June 2007. It is a very old video of Grandpa Jones singing one of this greatest songs called "Night Train to Memphis" - watch it, it is great! A very old TV-Show with Grandja Jones out of the 50s - must see! A very old video of Grandpa Jones. Here you can see that one of this most famous songs "Good old Sunny South" is more than 50 years old. And his humor to that time was a little bit dirty ;) Enjoy! A new - but very old - video of Grandpa. Maybe from the 50s.